A festive striped necktie by Parlsey Luxury Neckwear in XL Length. The fine ribbed pattern in the black background adds a nice structure to the tie that adds a perfect drape as well as gives the tie knot a nice dimpled look. 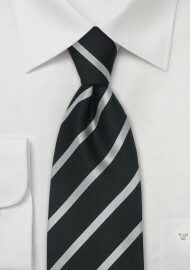 To match this tie we recommend the colors white, gray, and black on shirts and suit. Please note that this tie is made in longer length for the big and tall man. If you are above 6 foot 3 inches, and have difficulty tying a regular length tie to the right length, then XL sized ties will be right for you. Handmade from 100% silk.